Foldable electric kick scooters like the EcoReco M3 Scooter represent a transportation solution to help you connect the “first and last mile” of your commute. They can be a great solution for helping you to get from your home to mass transit, and then from mass transit to your work place. At a liftable weight of 34 lbs., the M3 can go with you in the car, on the bus, subway, train, ferry, taxi, boat, etc. With a top speed of 20 mph and a relatively large battery (36V 8ah LiFePO4), the M3 can cover some distance (stated range of up to 23 miles). 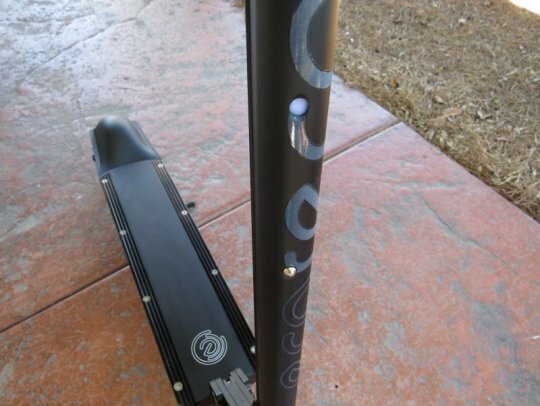 So it may be a good solution for more than just the first and last mile of your commute. Like an electric bike, you still do some of the work to kick off from a stand still and on some hills you will still need to do your part. And of course, any additional work you do will help to increase your range. Low maintenance and simplicity is a nice feature with e-kick scooters like the M3. There is no chain to oil, no drivetrain to adjust, and the tires won’t go flat. 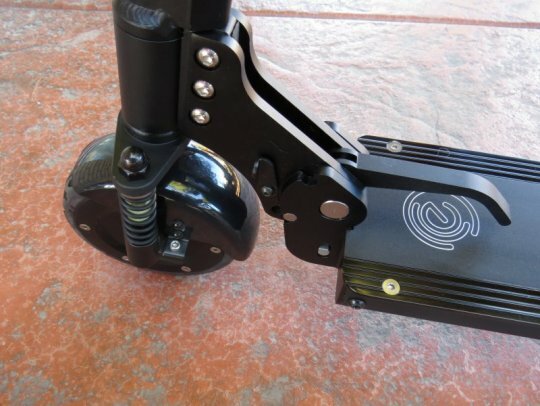 The EcoReco M3 Electric Kick Scooter is priced at $999. If you were a backer of the Kickstarter campaign for the M3, EcoReco would like to offer you the same pricing. In this first part of the review there are a BUNCH of detailed pictures and specifications to get you familiar with this electric kick scooter. Part 2 of the EcoReco M3 Electric Kick Scooter review will give you info on ride characteristics, results from the range test, pros, cons, and overall thoughts on this e-scooter. 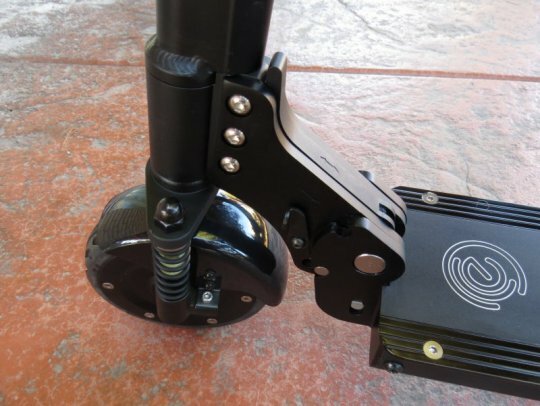 Alright, let’s get into the details of the EcoReco M3 Electric Kick Scooter! The EcoReco M3 electric kick scooter has some similar attributes to an electric bike. 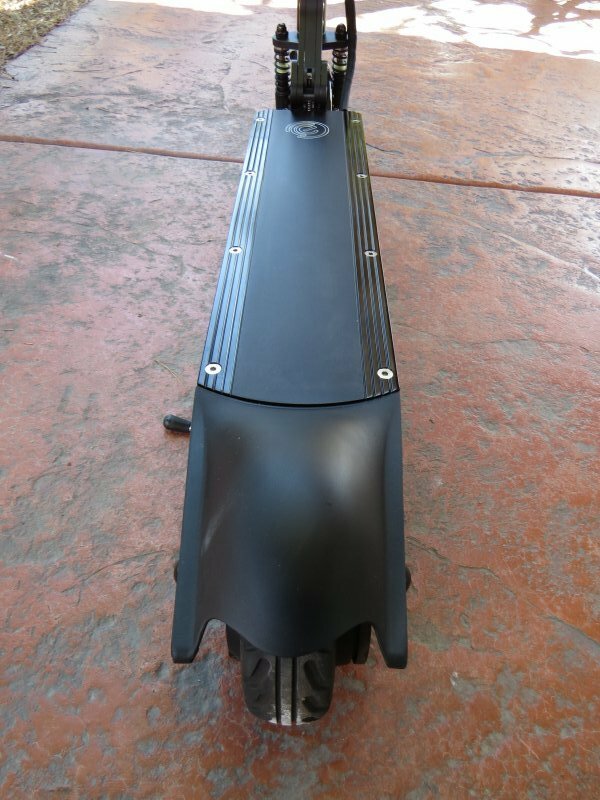 You still do some of the work (kicking) and the 250 watt rear wheel motor helps you cruise along. The 36V 8ah LiFePO4 is located under the deck/frame where you stand. The M3 can travel up to 20 mph and the stated range is up to 23 miles. 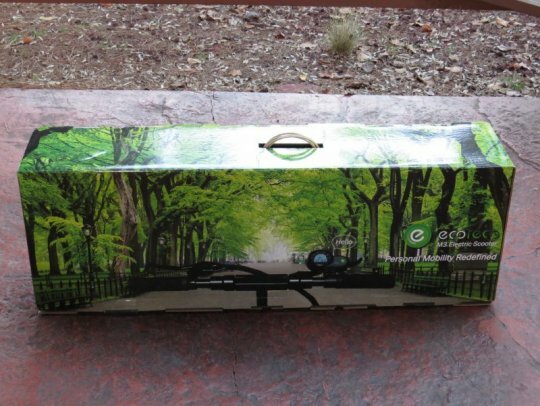 The EcoReco M3 Scooter arrived in a compact box with carrying handle. The M3 unboxed. 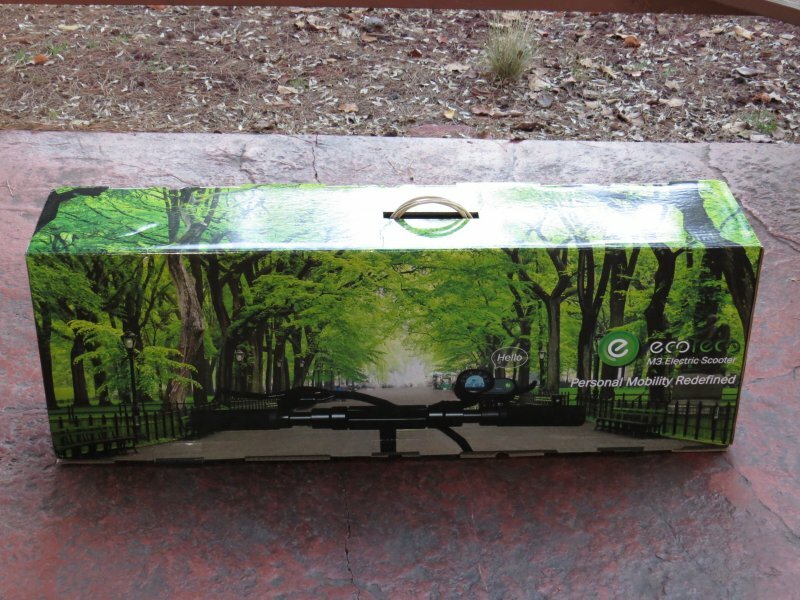 The cardboard box housed the charger and instruction manual. 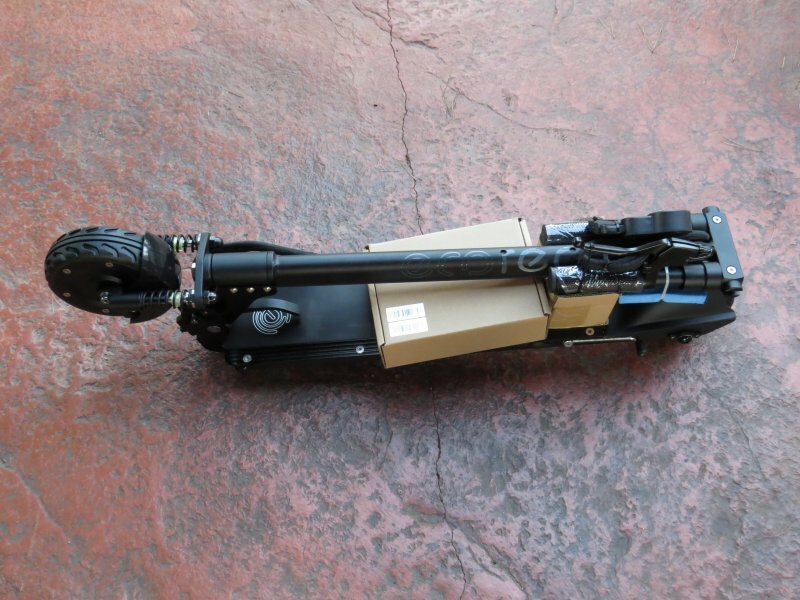 The M3 folds down to a pretty compact size (36″ long x 12″ tall) for transporting in a car, on a bus, subway, train, taxi, boat, etc. It weighs 34 lbs. 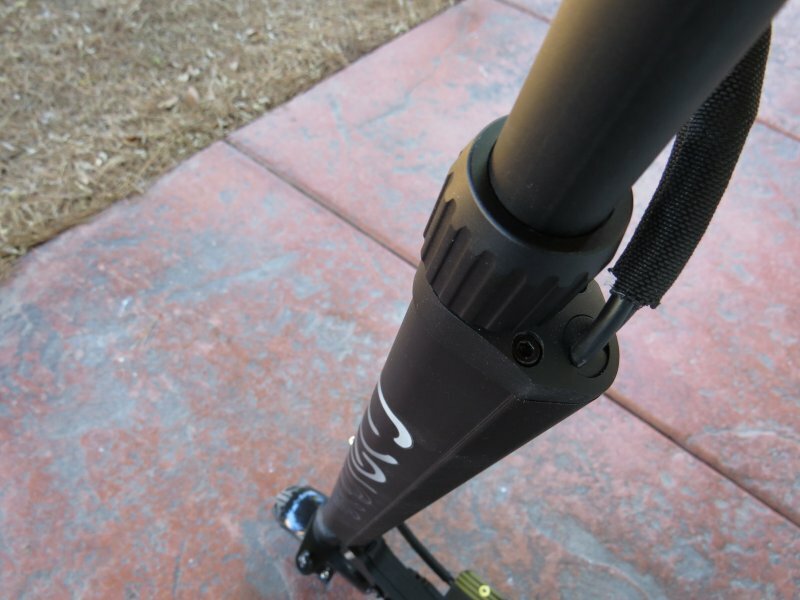 and that is a reasonable weight for transporting it short distances when it is folded. This is the folding mechanism for the front wheel and handlebar. 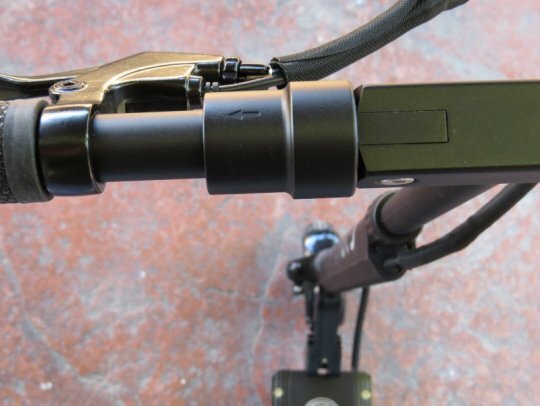 When unfolding the M3, the front wheel/handlebar click into place with a locking bar. Note that there is also a lever that must be closed to complete the secure connection. 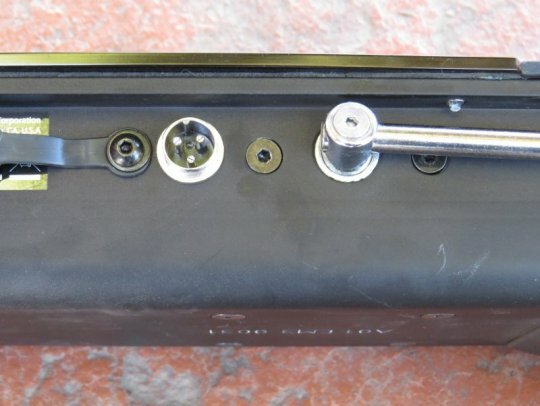 In this picture the folding mechanism has been completely secured. 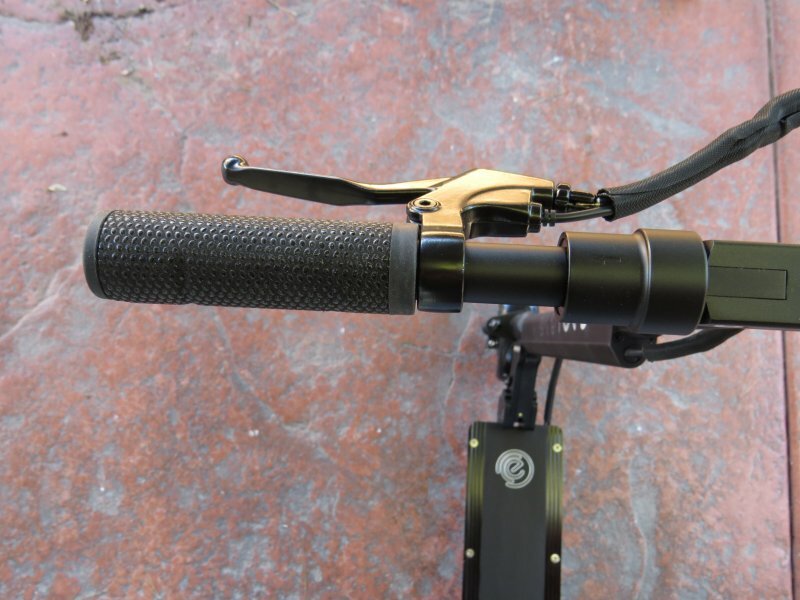 Each side of the handlebar can be folded down to create a compact size for transport. Unfolding them is as easy as moving each side up and into position. There is a sliding collar that secures each side of the handlebar in place. 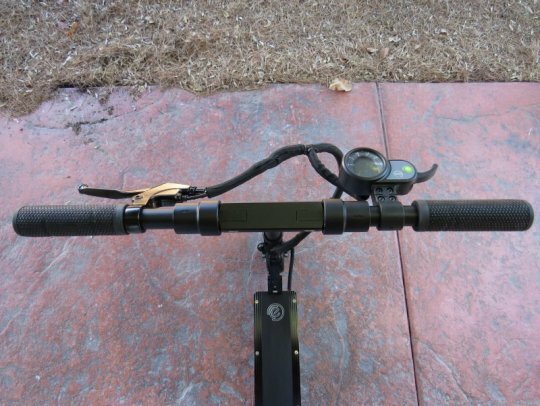 To fold the handlebar down, slide the collar to the side and push the handlebar down. This is the handlebar mast and mast tube. Note the clean cable routing inside the mast tube. The handlebar mast has 2 heights that you can choose from. Note the holes in the mast tube. The mast has a button that clicks into those holes. 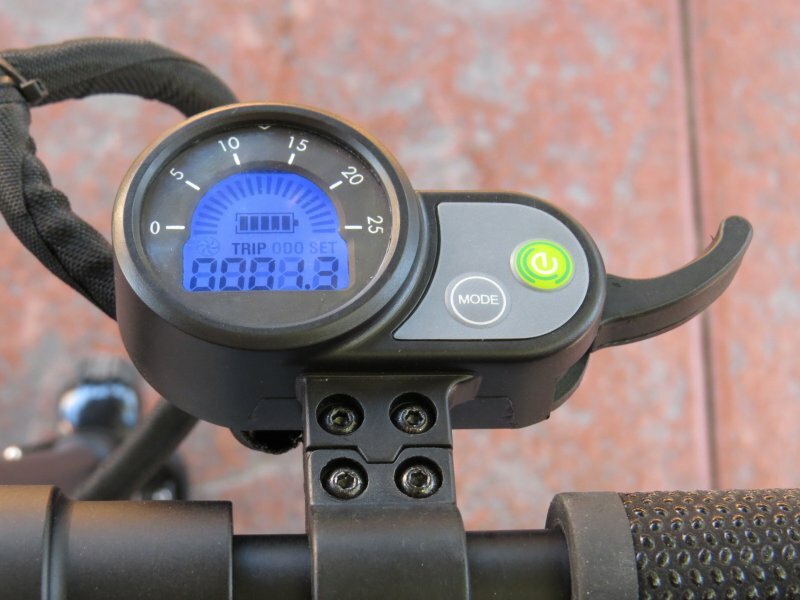 The handlebars have the rear brake lever on the left with the LED display on the right. 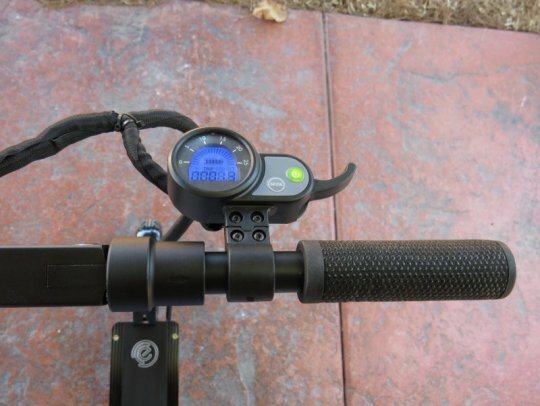 View of the right handlebar with the handlebar folding collar, LED display with trigger throttle, and grip. 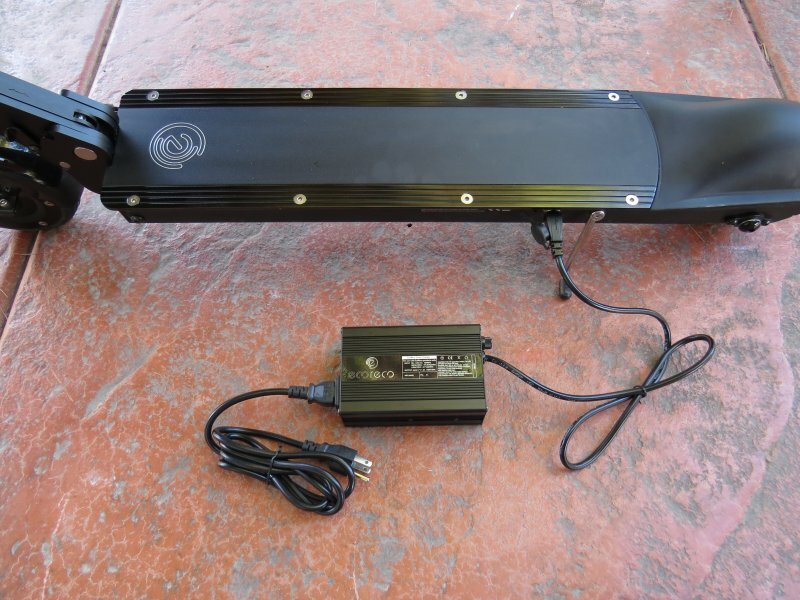 The LED display and trigger throttle. 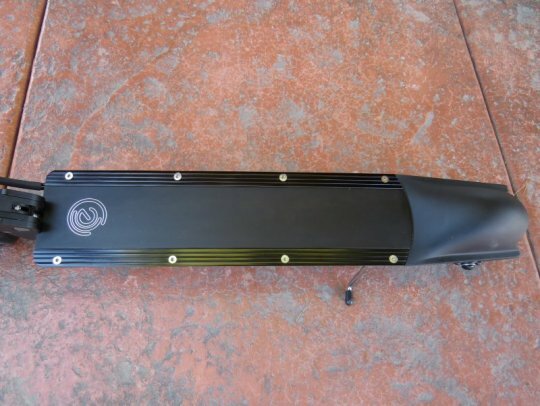 The display provides information like current speed, trip distance, odometer, and battery level. It is backlit to make seeing information at night possible. 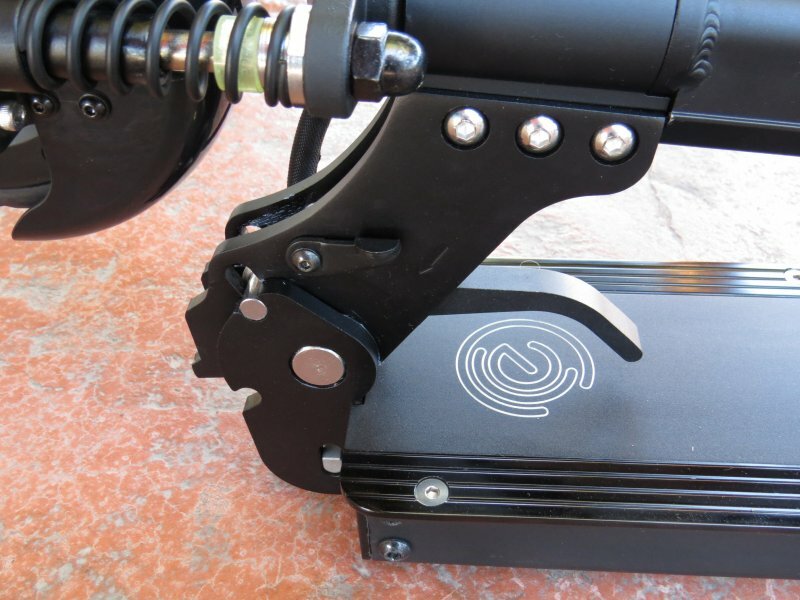 The trigger throttle provides an intuitive way to add different amounts of electric assist. 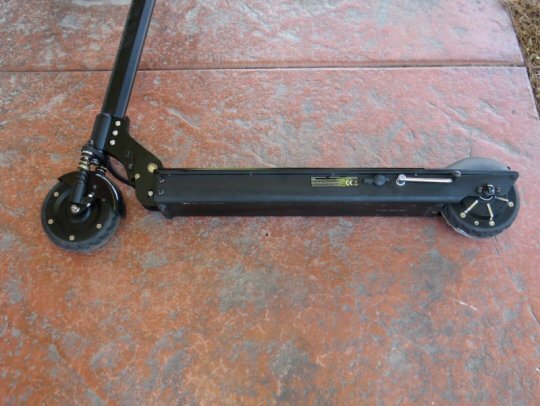 In order to use assist the scooter has to be moving a little bit. That is a safety feature in case you were to grab the throttle and not mean to! There is a way to change this feature if you want instant on from a stand still. Check with EcoReco for more info on that. 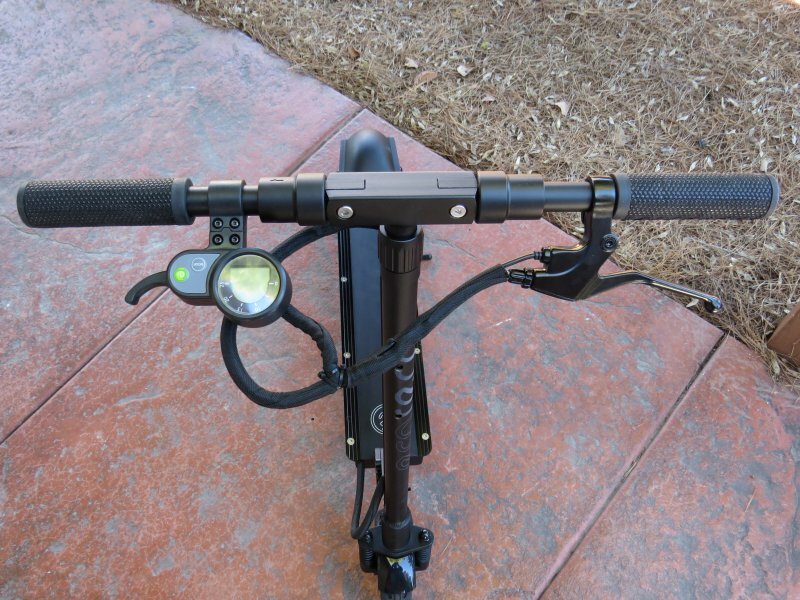 The left side of the handlebar has the handlebar folding collar, rear brake lever, and grip. The M3 comes with a front suspension fork that provides a little bit of travel to take the edge off of rough roads. 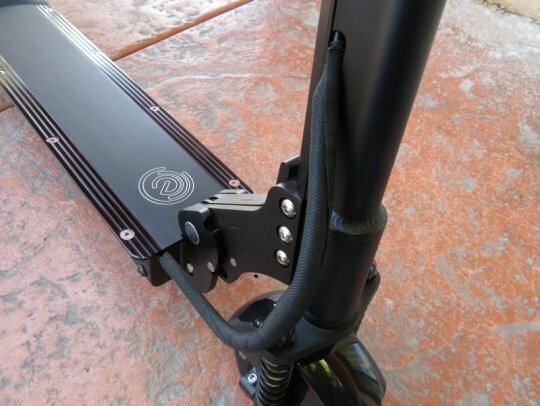 The cables/wiring on the M3 are protected by an over wrap that also keeps things looking clean. 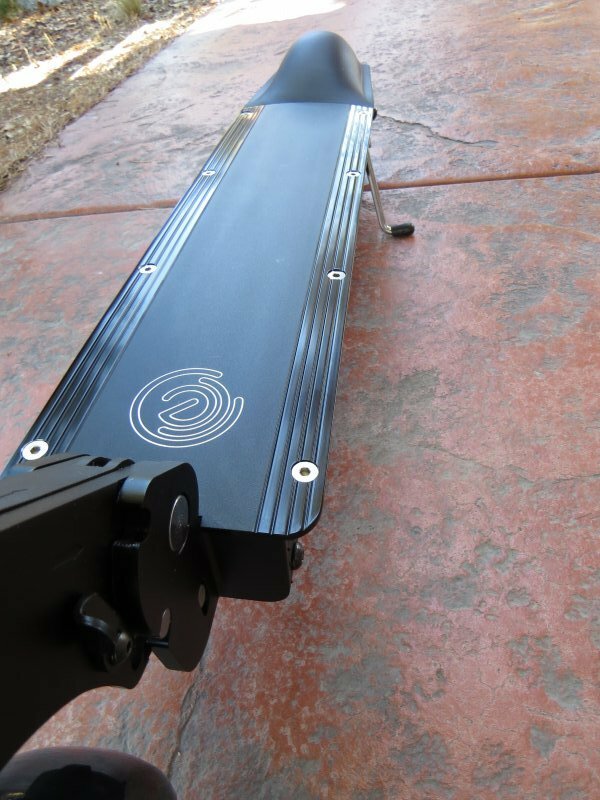 The 36V 8ah LiFePO4 battery is housed in the aluminum main frame, below the deck that you stand on. 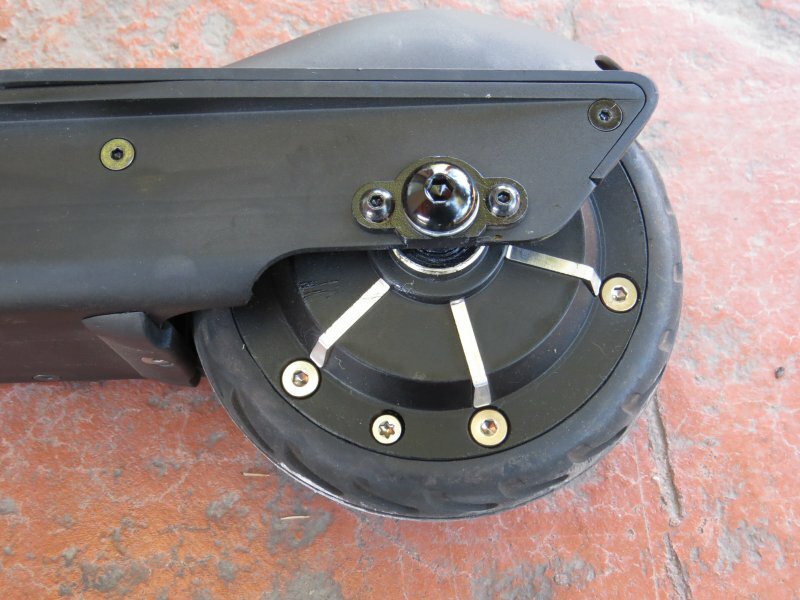 This is the brushless 250 watt rear wheel motor. 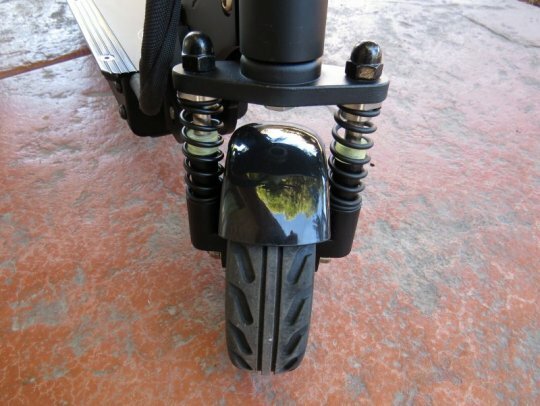 Note that the tires are solid rubber; no need to worry about flat tires! This is the deck that you stand on. The battery is housed below this deck. There is a fender over the rear wheel. On the left side of the scooter is where you will find the charging port and the kickstand. The included charger can charge the battery from empty to 85% in 2.5 hours and fully charge it in 4.5 hours. Stated Range: 23 miles. 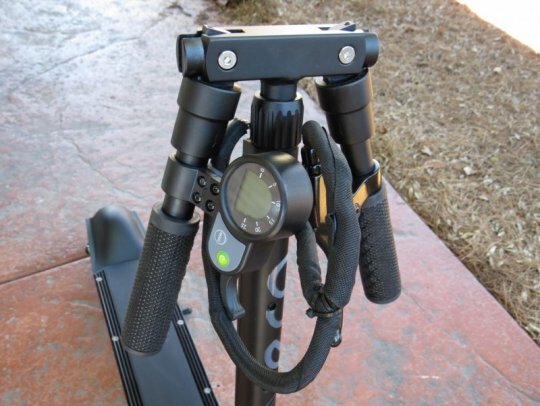 Stated range is for a 170lb rider riding on a flat ground at steady speed of 13MPH. If a heavier rider constantly reaches top speed, brakes frequently, and takes occasionally slopes, the range would be reduced to more modest 10-13 miles. Price: $999 USD at the time of this review. If you were a backer of the Kickstarter campaign for the M3, EcoReco would like to offer you the same pricing. 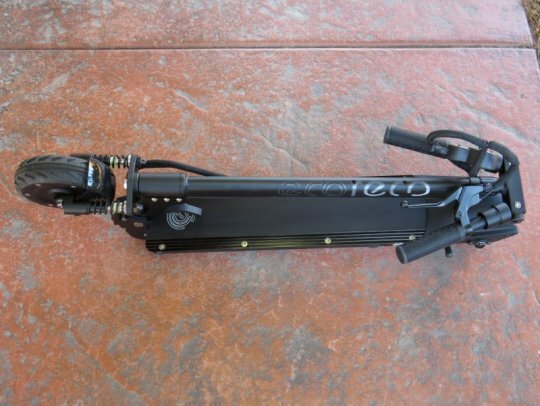 Here is a link to the specifications page of the EcoReco M3 Scooter. 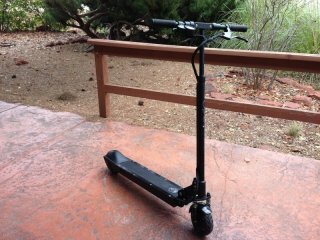 Now, checkout Part 2 of the EcoReco M3 electric kick scooter review with info on the ride characteristics, the range test, pros, cons, and overall thoughts! Evo 1000w $400 to 500 seat included if needed. Looks well built. Beautiful design! Not much rubber around motor, must be strong for running off curbs and cracks.